Dry weather isn’t just rough on your skin, it’s rough on your general health and even on your home. We’ve rounded up the best humidifiers for every space so you can breath easy, stay healthy, and keep your home in top top shape. There are several reasons for you to want a humidifier. On one hand, it’s the winter and you’re sick of dry skin and nosebleeds. On the other hand, you’re tired of dryness making you vulnerable to illnesses. Maybe you just hate that your clothes are always crackling with stactic. Whatever your needs, there’s a humidifier for you. But with so many cases to need one, how do you choose which humidifier to buy? There lots of different types of humidifiers out on the market, so purchasing one can be pretty daunting. We’ve broken up the categories based on key factors like the size of the unit, how much space it can humidify, and the style of humidification. These styles include warm or cool ultrasonic mist humidifiers, which are best for children and families, evaporative humidifiers, which are less work to maintain, or purifier humidifiers, which are helpful if you’re more susceptible to illness. We’ve even included a whole house humidifier for home owners in search of a big solution to their very dry big space. When most people think about humidifiers they think about the little table top models you use when you’ve got a sick child. Most people are unaware of the option of an entire house humidifier. 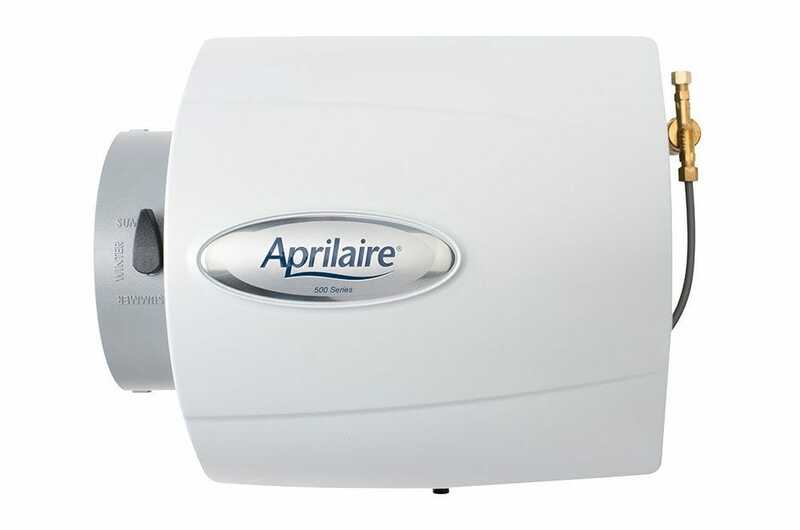 The Aprilaire 500 Humidifier can control moisture in a space that’s up to 3000 square feet. Worried about a humidifier that will create too much moisture? No problem—The Aprilaire will automatically sense the humidity level in order to regulate the moisture in the air, so you can say goodbye to those foggy windows! If your entire family is waking up uncomfortable with cracking skin and bleeding noses, then maybe this whole house humidifier is for you. The Aprilaire 500 Humidifier controller will detect the low humidity levels and add moisture into the air. With this constant control, you’ll be able to bump your thermostat down in the winter because of how comfortable you’ll feel (humid air feels warmer). You’ll even see (and feel) the results within hours after installation. Now, unlike the other solutions in our roundup, this one is a bit more complicated than just plugging in a device and pouring some distilled water into it. It’s not dangerous or incredibly complicated to install a whole house humidifier but if you’re not a very handy sort of person with experience doing this kind of home project, it’s best left to an HVAC contractor who can fit it properly, tap it into a nearby plumbing line, and wire in a humidstat to control it. If retrofitting your home with this humidifier isn’t an option, check out some of the simpler, seasonal, or cheaper options that we’ve picked out below. Want a humidifier for your bedroom or living room that makes the air smell good and doesn’t require you to constantly refill it with water? What about all that an a built in nightlight? 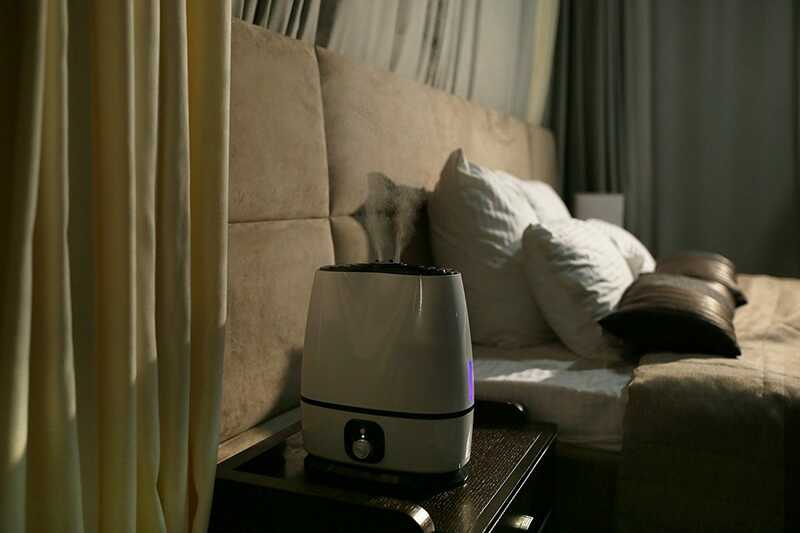 The Everlasting Comfort Ultrasonic Humidifier can do it all. The wide nozzle dispenses a cool mist which allows you to control the humidity in the room. It even holds 6 liters of water, which (based on its output settings) can support up to 50 hours of continuous use. Avoid buying two different machines to do the tasks of adding moisture AND diffusing aroma into the air. This humidifier comes with a built-in diffuser that atomizes your favorite essential oils that you place in the vaporizer tray. Sit back and relax as the humidifier diffuser disperses the pure, clean-smelling aroma with a light mist. There’s even a calming blue LED night light that’s located on the side. So sleep soundly knowing your air is clean, smells good, and has a relative humidity kept above 43%—and stay asleep because this humidifier is super quiet and shuts off automatically when it’s out of water in order to prevent damage to the machine. Want to add moisture to the dry air at work, but don’t want a huge humidifier that you’ll worry about tripping over? Look no further, because the URPOWER Cool Mist Humidifier, which is about the height of a smartphone, is small enough to place on your desk at work (or even your nightstand at home). It can last up to 6 hours without any refills, and can hold up to 100 mL of water. The URPOWER humidifier is so compact, it’s perfect for easy travel. Plus, it’s great for aromatherapy. Just choose your favorite essential oil, remove the lid at the top that holds the water, and add a few drops of the oil to the reservoir. And if you’re looking to spice up your desk a bit, there are 7 colors to choose from that make this humidifier a lamp as well. Both the humidifier and the lamp have programmable on and off cycles, so you can have continuous or intermittent mist or lights. 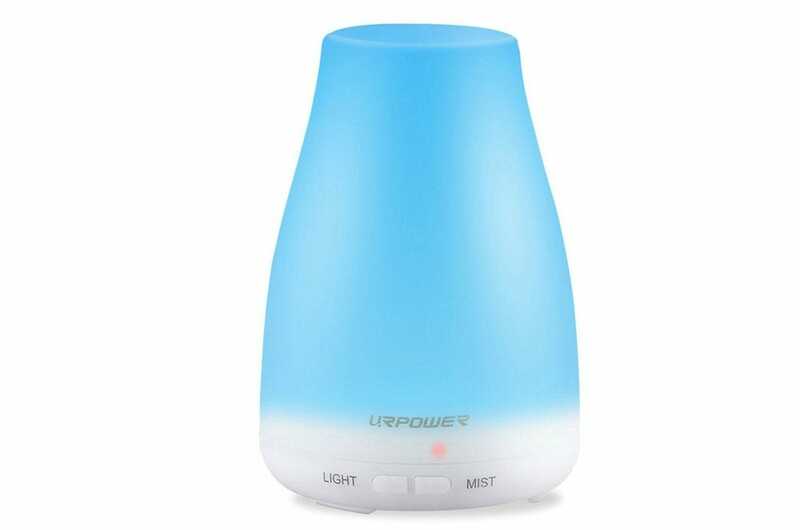 This little ultrasonic humidifier may not cut it when it comes to pumping moisture into the whole first floor of your house but it works very well for small bedroom or office spaces. The Everlasting Comfort Ultrasonic Humidifier was our top pick for all-in-one features but if you’re looking for raw output, a real Cadillac-class ultrasonic humidifier, the Levoit is it. An ultrasonic humidifier can turn water into a mist because there’s a metal plate inside of it that moves at sonic speed (hence its name) to break the surface tension and launch the water molecules into the air. The droplets in the mist are so small that they evaporate before reaching the ground. What makes the Levoit our pick for this type of humidifier is that the mist it disperses can be warm or cool—most humidifiers only allow for the cool mist option. Having the warm mist option allows you to raise your humidity level 25% more quickly than with a cool humidifier alone, and can reduce bacterial contamination in the air. Further, if you want to add moisture to an air conditioned room you can do so without adding heat too. 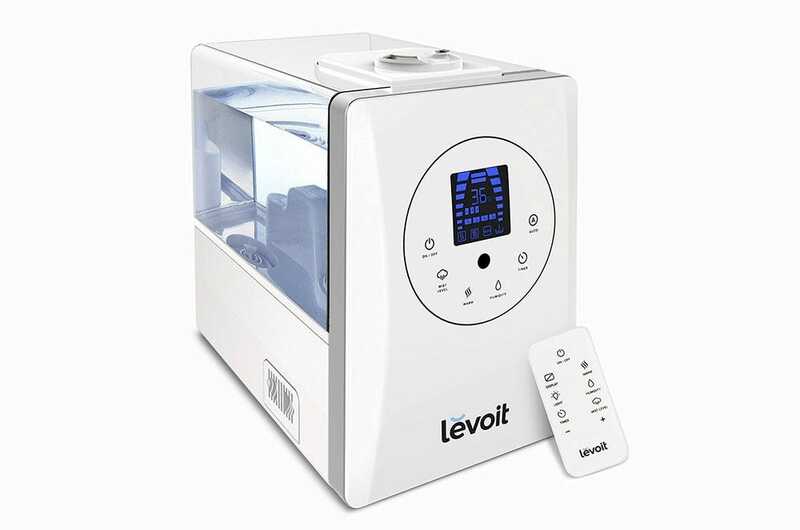 The Levoit humidifier will automatically adjust to your preferred preset or you can easily manually override it for immediate additional moisture. It even comes with a remote where you’ll be able to turn the machine on or off, choose between auto settings, custom settings, or timer, and choose between a warm or cool mist. Lastly, it holds 6 liters of water so you can go 20 to 36 hours without refilling, depending on your settings. For a good-quality, leak-proof design, this ultrasonic humidifier is a steal, especially with the warm and cool mist options. An evaporative humidifier works a bit differently than an ultrasonic humidifier, but they can both get the job done. If you’re looking into getting a humidifier and want one that is self-regulating and takes less work to control settings, then an evaporative humidifier might just be for you. The Vornado Evap40 Evaporative Humidifier is our pick for the best evaporative humidifier—you may recognize the brand name from the space heater market where Vornado has a large line of space heaters well known for their efficiency in air movement. Their humidifier incorporates many of those same design elements. Here’s how it works: dry air is sucked into the humidifier and is blown over the deep pitch blades to produce humidity, which is then either released into the air or evaporates. The Vornado Evap40 can humidify up to 1000 square feet with its vortex circulation of the air, distributing moisture much further than not only ultrasonic humidifiers, but most evaporative humidifiers as well. It even has an adjustable humidistat that can automatically control the humidity in the space. Other settings allow you to choose between low, medium, or high speed, but the resorvoir size is really what makes this stand out option for large spaces. With a four gallon capacity, you only need to refill the Vornado Evap40 once every 24 hours—which isn’t hard at all since this humidifier is airlocked, spill-proof, leak-free, and easy to clean. 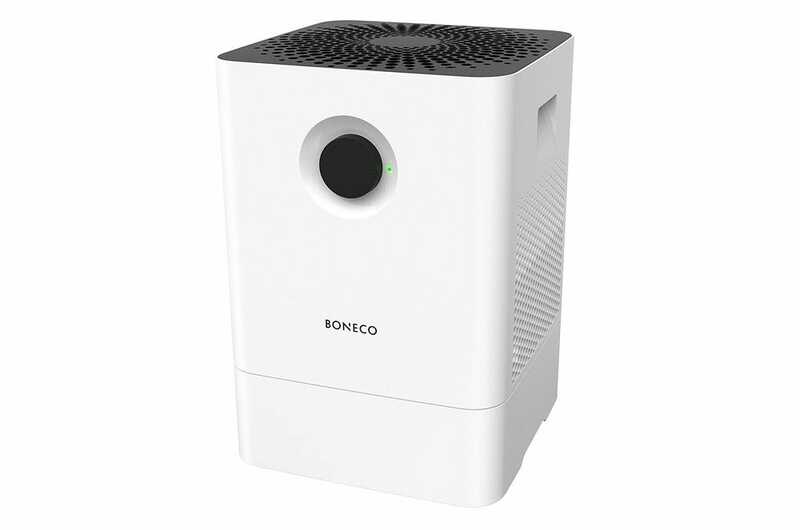 The last humidifier on our list is the BONECO 2-in-1 Air Washer. Many humidifiers, while effective in putting moisture in the air, don’t help out as much with bacterial contamination in the air. 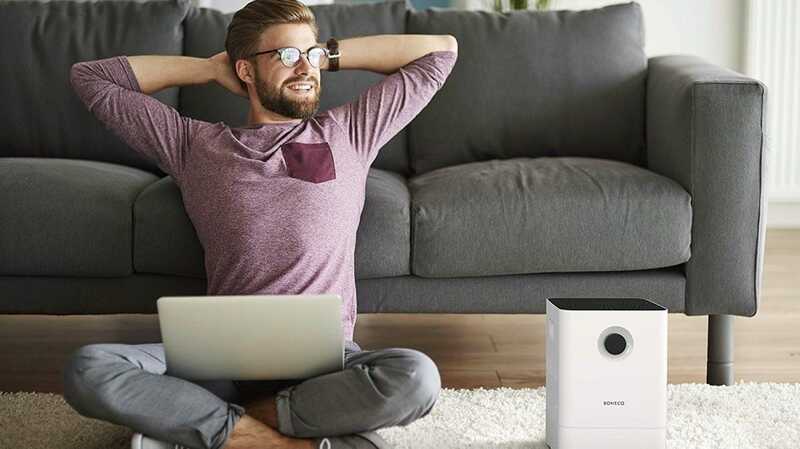 BONECO is a humidifier and an air purifier, so it can add humidity while also cleaning the air of bacteria, pollen, and dust with an evaporative mat that rotates through the water to filter out the contaminants. 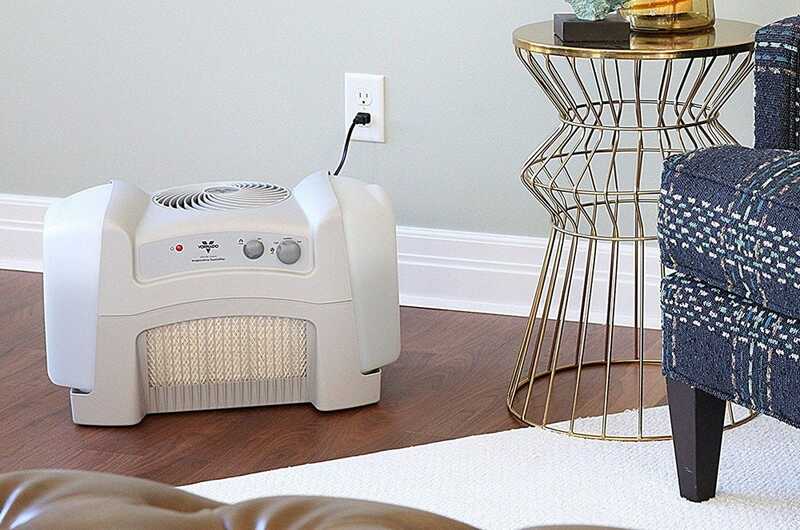 This humidifier-purifier combo can cover 540 square feet, and isn’t cumbersome or bulky, so placing it in you living room won’t make it look out of place. Overall, it’s simpler to use and clean than most humidifier; it has a power and a sleep mode, and if you want to clean it, just place the base of it in your dishwasher. Lastly, you can add scented oil to the water so that the air is not only clean, but it smells fresh, too. Between the simple design with few moving parts and the ability to add in a little soothing aroma therapy, there’s not much to stress about with the BONECO on hand.